I love making muffins for Fuzz, but she’s picky about texture and doesn’t love chunks of fruit in her muffins. Something must have changed, because a few days ago she told me her new favorite muffin was blueberry. I think maybe someone slipped her some box-mix muffins where the tiny canned blueberries add flavor and color but not texture — gateway blueberry muffins. Now I can get her into fresh blueberry muffins. Blueberries have been on sale lately, so yesterday I made some fresh blueberry muffins for Fuzz. As a starting point, I used Marcy Goldman’s famous Lawsuit Muffins. Marcy offers all kinds of variations and includes a streusel topping, but I pared things down a little and made the muffins using Marcy’s ratios, but without the streusel, cinnamon or citrus and with a mix of brown sugar and granulated. These muffins rose fairly high, had crispy edges, a dense texture, and a rich brown sugar flavor that made them different than your usual blueberry muffin. They were very good and I’d make them again for friends. I also think this recipe would make a great base for peach muffins…maybe with a little cinnamon? Stir flour, baking soda, baking powder and salt together in a bowl and set aside. In another mixing bowl, whisk together the granulated sugar, brown sugar, oil, egg, vanilla and buttermilk. Gently stir the flour mixture into the liquid mixture. When halfway mixed, add the frozen blueberries and stir just until blended. The batter will be thick. It reminded me of chocolate chip cookie dough, but runnier. 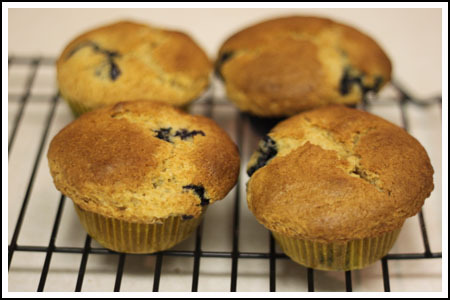 **Freezing the blueberries helps keep them from bleeding into the batter. I made these this morning. Great muffins and easy. I did not freeze the blueberries. The only thing I would change is the time and temperature. Mine were getting too done on top so I dropped the temp to 350 before the 20 mins. They ended up kind of sinking in the middle. However, I did just get a new oven and it may run hot. Maybe it just takes some getting used to. What’s funny about Fuzz is she’s picky about muffin textures (less so now, I guess), but the most adventurous eater in the family. She’ll gobble down things like wild hare and quail eggs, but raisins in muffins??? Forget about it. Shannon, I hardly ever butter muffins. I think it’s because I tend to pick muffins that are already kind of rich and don’t seem to need it. I’m sure if I started buttering them I’d get used to it ;). I love blueberry muffins!!! Especially when they are smeared with butter. Isn’t it nice when your kids discover they actually like a food they’d previously didn’t?! My son recently tried fresh blackberries at a potluck dinner and announced he loved them (before he wouldn’t eat them). Ahhh, signs of maturity. BTW, our favorite blueberry muffins are made using Lee Bailey’s blueberry buckle recipe. I made some yesterday as part of my 5 dozen muffin/5+ dozen cookie baking spree for our upcoming beach vacation! Delicious! I’ll have to try them. I just bought a pint of blueberries, I’m tempted! These look delish. you and i both – marcy goldman fans. yummy looking muffins! i’ve been looking for blueberry muffins recipe and bam! you posted it here, THANK YOU! Sounds great–I’ve got some blueberries AND peaches in my freezer. ok i love muffins that rise nice & high. anna do you have a apricot crumb cake recipe, one that i think is made w/ shortbread crust by chance? lol did you do the alton brown muffins yet? So what did Fuzz think of these muffins? Stacie, I’m having one today and the muffins taste even better on day 2. I bought fresh blueberries today just to make muffins! I’ll have to try this recipe tomorrow morning!